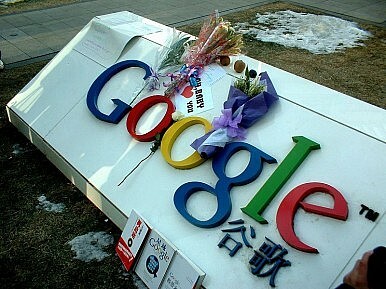 Google's logo in Beijing was decorated with flowers in 2010 after the company announced its withdrawal from the market over censorship concerns. Though the Chinese government certainly isn’t alone in its readiness to stifle freedom of expression or use surveillance to repress dissent, it remains, according to Freedom House, the chief global offender against internet freedom. Implementing Dragonfly in China would undoubtedly establish a dangerous precedent, one that would make it harder for Google to deny similar concessions to other countries with authoritarian inclinations. This battle comes at a volatile political moment, with the Chinese government openly expanding its surveillance powers and tools of population control. Many of these tools rely on advanced technology, and combine online activity, personal information, and mass monitoring to track and profile citizens. Providing this system with open access to user data, as required by law, would arguably make Google complicit in widespread oppression and human rights abuses. The search engine would not only facilitate censorship, but enable government-directed disinformation, destabilizing the ground truth on which free deliberation and open discussion relies. Such controls would likely be used to silence the marginalized and favor only the information that promotes government interests. On December 11, Google CEO Sundar Pichai appeared before Congress, where he faced questions on the project. Pichai stated that “right now” there were no longer any plans to launch the search engine, though he refused to rule out the possibility in the future. Google had originally aimed to launch Dragonfly between January and April 2019. Leaks about the plan and the remarkable backlash that ensued both internally and externally have forced company executives to shelve the plans – at least in the short term. Though the plans have been abandoned for now, Google’s decision to consider capitulating to China’s demands raises important concerns about Big Tech’s ability to enable rights abuses, and the use of technology to aid the powerful in oppressing the vulnerable. It questions the understanding that Google is a company willing to place its values above its profits. For now, it seems Google is not too powerful to be left unaccountable. William Chalk is a senior researcher at Top10VPN, an independent cybersecurity research group and the world’s largest virtual private network review service. Top10VPN has been recognized by leading publications around the world for its advocacy of digital privacy and security rights. Ahead of Tiananmen Incident Anniversary, China Launches a New Round of Internet CrackdownGoogle's China Plans: Backtrack and BacklashChina’s Top News Apps Fall Victim to Government Ban — AgainChina’s Rising Tax on InformationWhy Are Chinese Netizens Excited About Russia's Ban On VPNs?